Bernice Hazel Riggs Harms went to be with her Heavenly Father on Wednesday, March 14, 2018 at 10:15 P.M. She was born on July 16, 1922 in Burns, Kansas to Glen Thomas Riggs and Julia Marie Bolan Riggs. Bernice was the oldest of four children in the family, and she has been predeceased by her parents and her three brothers LeRoy, Howard, and Carl, as well as her loving husband, Lawrence. Bernice is survived by one sister-in-law, Norma Riggs of Marion, Kansas, and two sisters-in-law, Arlene Morris and Norma Bledsoe both of Eureka, Kansas. Bernice Harms leaves behind two sons, five grandchildren, and eight great-grandchildren. Alan (Peggy) Harms and Roger (Mary Adele) Harms; Grandchildren: Melissa (Paul) Varga, Stephanie (Scott) Carmony, Amanda Harms Hellmann, Audra (Amilcar) Quetzal, and Jared (Emily) Harms; Great-Grandchildren: Benjamin Varga, Abigail Varga, Lauren Varga, Macy Carmony, Caroline Carmony, Sophia Hellmann, Mikayla Hellmann, and Everett Harms. Bernice grew up in the small town of Burns, Kansas and met the love of her life, while attending high school. Lawrence Chester Harms and Bernice Hazel Riggs were married in her parents’ living room on October 11, 1942. The small Methodist church organ was brought to the house to provide music. Bernice and Lawrence remained in the Burns, Kansas area, until the military moved them to Fort Myers, Florida. They remained Fort Meyers, until the air base was closed in 1946. They returned to Burns, Kansas, where Lawrence worked and Bernice became a housewife and mother to their two sons. Alan was born in December of 1946, and Roger was born in July of 1951. Bernice enjoyed her life, as wife and mother. It allowed her to be the ultimate care-giver. She cared for her husband and two sons and provided the stability and support they needed. Bernice was always there when a “mother’s touch” was required - from her lovingly performed daily routines, to a necessary scolding that might result in saying, “wait till your father gets home!” Bernice and Lawrence provided the ideal atmosphere for raising a family, with love and attention, whenever and wherever it was needed. 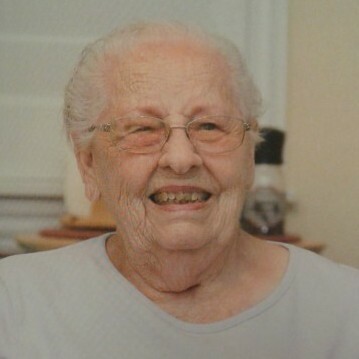 In her later years, Bernice chose the name of “MeMe,” which was used by all of her Grandchildren, Great-Grandchildren, plus many of her friends. Lawrence’s work eventually moved the family to Fort Lauderdale, Florida in 1958 for a seven year period, and then to Rio Hondo, Texas in 1965, where they remained for the rest of their lives. Once the boys were grown and gone, Bernice was able to pursue her love of arts and crafts and making friends, which she loved to do. Her creative mind produced a multitude of nick-knacks and gifts throughout the years. Bernice’s ability to lovingly embroider kitchen towels for others is something the entire family will treasure, enjoy, and remember for many years to come. In addition, Bernice loved to sing. Wherever Lawrence and Bernice lived, Bernice would sing in the church choir. Bernice was a member of the Rio Hondo Community Church Choir for almost 50 years. Her love of music began in Burns, Kansas with school productions of operettas, and playing tuba in the band. The Harms Family would like to extend a heartfelt thank you to the kind, caring staff at the Harlingen Medical Center, Solara Hospital, and the entire staff and friends of Bernice at the Golden Palms Retirement Center. The kindness, love and support for Bernice by her Rio Hondo friends has been wonderful. Thank you to the Rio Hondo Community Church members, especially Chris, Carmen, Kevin, and Ryan Hall, and Mrs. Joan Reiff, who spread love, comforting prayers, and service to all in need. Special thanks to Dr. Elizabeth Juarez from the Harlingen Medical Center, along with Dr. Emmanuel Akinyemi; Dr. Sheriff Hilmy and staff from the Heart Clinic. A very special thank you to the entire residential community and staff from the Golden Palms Retirement Center and the Golden Palms Rehabilitation Health Center. Visitation will be at the Buck Ashcraft Funeral Home on Ed Carey Drive in Harlingen from 5 – 7 P.M. on Friday, March 23, 2018. Interment will be on Saturday, March 24, 2018 at the Mont Meta Memorial Park beginning at 10:00 A.M.
Services will be held at the Rio Hondo Community Church on Saturday, March 24, 2018 beginning at 11:00 A.M. with a reception/luncheon to follow in the church basement to celebrate the Life of Bernice Harms, our “MeMe”. In lieu of flowers, the family is requesting donations be made to the Rio Hondo Community Church, P.O. Box 157, Rio Hondo, Texas 78583.